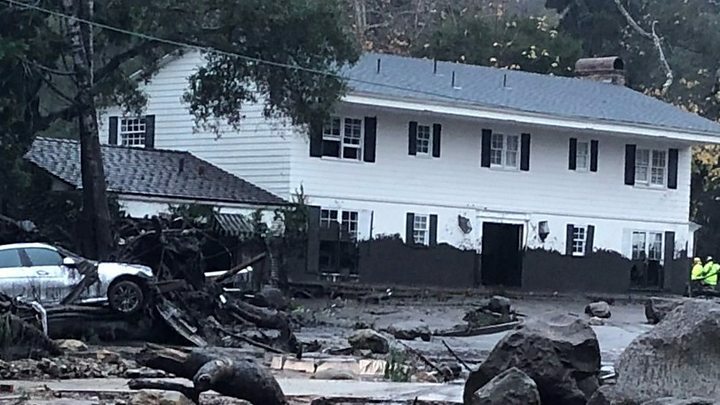 At least 13 people are dead amid “waist-deep” mudslides in Southern California, where heavy rains triggered flooding, say officials. A group of up to 300 people are reportedly trapped in Romero Canyon, east of Santa Barbara. Police said the scene “looked like a World War One battlefield”. The flooding and mudslides, affecting areas scorched by wildfires last month, have shut down more than 30 miles (48km) of the main coastal road. Emergency services said a number of people were unaccounted for and they expected the number of deaths to rise. Thousands fled the deluge and more than 50 rescues have been performed. The hardest-hit homes were those that were not in the evacuation zone, officials say. Among those taken to safety was a 14-year-old girl who had been trapped for hours in the ruins of her home. The fire department published a picture of the girl encased in mud as she was led to safety. County Fire Captain Dave Zaniboni said that five people were found dead on Tuesday in Montecito and may have been killed as result of the storm. The upmarket neighbourhood includes homes owned by celebrities such as actor Rob Lowe and chat show host Ellen DeGeneres. Oprah Winfrey also has a property in Montecito that is reportedly worth nearly $90m (£66m). Thousands of California residents were asked to leave their homes on Monday for the second time in two months. In Burbank, where waves of mud swept away vehicles, officials issued a mandatory evacuation order. Homeowners in the area shared photos of mud in their homes. Several roads are closed, including the major Highway 101. Wildfires in December, including the Thomas Fire, swept through the area burning vegetation that helps prevent flooding and landslides. After a wildfire, burned vegetation and charred soil create a water repellent layer which blocks water absorption and leads to an increased risk of mudslides and floods. The Federal Emergency Management Agency shared a warning for California homeowners explaining that homes that had never flooded before were now at risk. This comes after a record-setting year of $306bn (£226bn) of weather and climate-related disaster costs in the United States, the third warmest year on record, according to the US National Oceanic and Atmospheric Administration. The storm over California is expected to produce 4in to 7in (10 to 18 cm) in the foothills and 9in (23cm) in select areas. Snow is falling at higher elevations, according to the National Weather Service.